This figure hugging prom pageant dress showcases a sweetheart neckline and thin straps that criss cross in the back. The torso is fully embellished with shimmering beads and sequins. 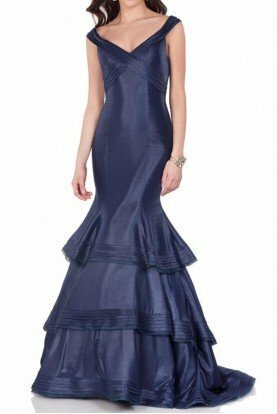 This unique mermaid style skirt features ruffled tulle that is edged with a satin ribbon for a sleek look. Ellie Wilde 117101. According to the designer size chart, this dress fits 37/29.5/40.5. Length: Approximately 60 inches.